We’ve already had one big new technology launch with Landa Digital, but 2013 looks like it goes down with 2. Today HP has announced their latest ink jet technology development – a page-array printhead – together with the first printers and multi-function machines that will use them. 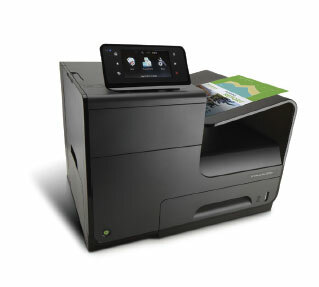 These machines are designed to be very competitive to colour laser printers – twice the speed at half the cost. The spec. is 70 pages per minute in “General Office quality mode”. The printhead resolution across the page is 1,200 dpi and there are 42,240 nozzles. HP’s pigmented inks are used which in conjunction with Colorlok paper should produce strong colours by “crashing” the colorant on the paper surface. The printhead uses the HP SPT thermal ink jet technology with surface heaters, and generates 6 pl drops at 10 m/s. If the printer is printing at 1,200 dpi along the page at 1,200 dpi then the drop frequency is around 16 kHz. The printhead is intended to last the life of the machine. The printhead is made from 10 dies in a staggered overlapping architecture. A big issue with page arrays is nozzle failures. The new machines have a scanning optical drop detection system which uses a back scatter technique. This operates while a test pattern is being ejected by the nozzles. If nozzles have failed then other nozzles are substituted to hide the defect as much as possible and avoid visible banding. Nozzle maintenance is via a cleaning web wrapped around a wiping roller. So, a big surprise? Well, not to the companies who subscribe to our Directions ink jet patent review service. We’ve been reviewing patents relating to this technology over the past year so we could see what might be coming. To find out more about Directions you can visit our new web site www.inkjetpatents.com. You can find out more about HP’s technology from their White Paper.